Family Day came and went and it was a nice reminder that spending time with family, unplugged and in-the-moment, is really important. Our Summerwood family practices the age-old saying, “Families that play together, stay together.” It got us thinking that a cohesive family is like a Summerwood build – where all the parts fit together to create something special and built to last. Life can get busy and sometimes it feels like a luxury for families to come together, but we feel that it can happen at anytime, without a special occasion or holiday. As everyone in the family grows older, it’s important to stay engaged with adventures, experiences and home projects because those memories will last a lifetime. How do we know? For more than 20 years, our customers have shared images and stories of their families working together to create their fabulous builds, whether a gazebo, cabin, playhouse or workshop. We’ve seen multi-generations enjoy their outdoor space, from celebrating life milestones, backyard play dates, to spending relaxing long weekends together. Proactively scheduling family time is important, so what could be more appropriate than starting on Family Day? With Spring just around the corner, it’s the perfect season to get the family together to construct your Summerwood build, like a shed or workshop in time for gardening. Maybe it’s that cabana, gazebo or pool house your family has wanted to enjoy for the hot Summer months. These outdoor projects are a great way for families to build closer relationships while making memories, and possibly coming across some teachable moments. Along with the obvious advantage of getting children away from electronics and into the fresh air, there are a wealth of other benefits to including kids in outdoor projects. Here are our Top 10 advantages to involve kids. Kids grow and change quickly, so scheduled family time is ideal for busy parents to connect with their children. Especially when enjoying an activity together, parents will get to know their developing child better, and see their strengths and aptitudes. Working together as a family will not just help build a playhouse or whatever your Summerwood building may be, it also builds strong and caring family relationships. Families who share activities together as a group form solid, emotional ties, as a special relationship of trust and security develops. Studies have found that families who share in group activities that allow for mindful interaction hold a stronger emotional bond, and an ability to adapt well to situations as a family. Spending time together working on a project, family members learn how to listen and work together, while the child learns the value of communicating effectively and supporting others, important interpersonal skills they can take through life. Working toward a common goal, they understand there is a plan and that teamwork will make it happen. Kids learn commitment, responsibility, patience, work ethic, and the benefits of being part of a team to make a dream a reality! Children who spend time with their parents carrying out tasks are learning in a safe and supportive environment. With the freedom to make mistakes and find solutions on their own in a non-judgmental setting, children begin to gain self-confidence at an early developmental stage in their lives. When children have a real say in what happens and their views are heard, they will build a positive sense of self-worth, as they know that their parents value them. When children feel that they are valued, they feel greater self-esteem and are better equipped to succeed in life. When families take the time to participate in meaningful activities together, behavioural problems decrease, and kids are less likely to act out. Research has shown that teenagers with families who spend quality time together are less likely to use alcohol, drugs and engage in risky actions. If children know they can come to you with their tricky situations, they will likely choose better solutions to the issues they face in life. Learning doesn’t just happen in the classroom, but what the child learns outside of school can have a positive impact on their performance in school. A healthy emotional well-being, along with positive self-esteem, confidence, and good communication skills can work wonders in the classroom. Numerous studies have shown that children whose parents spend quality time with them perform better in school. In today’s fast paced, competitive, and technological world, children and teenagers are experiencing higher stress levels than ever before. Time spent in a non-judgemental family situation working with purpose towards a goal, takes children away from the social and school pressures that surround their lives, lowering stress and stimulating feel-good chemicals in their brain. Talking through the challenges encountered in the project, can also help children learn that the best solution to problems is to talk about them, something that can carry over into the rest of their life, helping them deal with worries. Quality time together with their parents helps kids develop parenting skills for later in their lives. As children from happy families are more likely to create a loving environment for their own children when they grow up, what you do this Family Day may well have a bearing on how your grandchildren enjoy Family Day in the future. Lastly, active family time creates warm and treasured memories that can last a lifetime. For years to come, every time they enjoy their Summerwood building, parents and children alike will be reminded of happy family times that made it happen. The adjective “cohesive” comes from the Latin word cohæsio, or “to cleave together.” Cohesive things stick together so they are unified just like your new Summerwood building, and your happy family. For inspiration on what type of building style your family can choose from, take a look at our 3D tours that showcase the interior and exteriors of some of our most popular builds. For families with younger children, we also have our playhouses that might spark some imagination! Never hesitate to contact us or visit our Custom Design Centre to create a Summerwood build to meet all of your family’s needs. It’s January – a time for new beginnings, setting plans for the year ahead, and making improvements to your lifestyle. If your new year resolutions include taking more time for yourself, to rediscover a hobby, or pursue a favourite pastime, then extra space may be what you need. Determined to make this year a great one, having a dedicated space to follow your passion will likely make all the difference. Adding an outdoor lifestyle building like a studio, exercise room or workshop may be the answer to achieve your goals in 2018! However, before you begin to even think about personalizing the interior and selecting materials for your new space, there are some important practical considerations to consider. As experts in designing and constructing lifestyle buildings, here are five of the first questions to help guide you. Build it yourself or not? The decision on whether to take on the project yourself or hire someone to do it for you should be your first consideration. Deciding factors include your dedicated free time, your budget, and level of DIY experience and competency. Even if you are an accomplished ‘do-it yourselfer’, consider the size of the building and the complexity of the design you have in mind. Do you have the time and the energy required for the task at hand? Whether you’re a DIY aficionado or plan to get all the help you can, our building kits are designed with ease of assembly in mind. Detailed easy-to-follow instructions, an assembly video, and all the essential parts you will need are included. As a reliable building partner, our Summerwood team is available online or by telephone to help guide you through it all. To help you decide if you are going to self-build or not, consider the two types of building kits we offer. There’s either “pre-assembled” format (think parts) or a “pre-cut” format (think pieces). If you have limited time or simply want to enjoy your Summerwood design as soon as possible, consider purchasing one of our pre-assembled kits. “Pre-assembled” means that major structural components such as walls, trusses and floors are built and framed for you allowing quick and convenient assembly. Depending on the size and complexity of your design, pre-assembled kits can be built by two minimally skilled people in a day or two. With the Pre-cut Format, we’ve designed the product to be purchased so the materials fit together perfectly, and can be easily handed over to you. Pre-cut buildings require about 50% more assembly time than pre-assembled structures, but are less expensive and will offer greater job satisfaction and sense of accomplishment to the do-it-yourselfer. If DIY projects aren’t your thing, or you’re short on time, then a Summerwood installation may be right for you. Summerwood offers the option to install your new studio, workshop, gazebo or whatever your new outdoor addition may be, if you live within a few hours of our Toronto HQ. Our team of experienced carpenters and craftsman know Summerwood products inside and out, making the build quick, easy, and always done right. Even if you are outside of our installation area, we are here to offer advice on employing a contractor. It is important to enlist the services of a qualified contractor who understands your expectations for the project. Rates can vary significantly, and you should request a quote before any assembly work begins. We have a long list of experienced contractors from across the United States and Canada that we’d be happy to refer to you. See our guide of ‘how to hire a contractor’. Style is a personal issue, that comes down to which design best suits you, your life, and the space available. We have a wide and varied choice of cabana, shed, spa room and many more design options to select from. Take a colourful 3D video tour of our most popular designs, and search over 1,000 photos of customers finished projects to discover the building styles that appeal to you. If you can’t find your dream building on our site, our expert design staff will create it for you. All our buildings can be customized to your own personal requirements. Get creative in our Custom Design Center and make something unique for your space. We are here to help – simply pick up the phone or send us a sketch and we’ll help nurture the budding architect inside, so your vision comes to life. While letting your creative juices flow to create a perfect outdoor building, pause to consider how large or complex a design you want to proceed with is. Decisions on the size, location, and style of your outdoor building are not entirely up to you, as a permit may be required. While most Summerwood buildings don’t require a permit, buildings exceeding 100 square feet might. There also might be restrictions such as a two or three-foot setbacks from a property line to contend with. Before you build, be sure to check with your municipality to ensure you are meeting the local requirements. It’s always better to be safe than sorry! If you require a permit, rest assured we’ll help make it as easy as possible to slice through all that red tape, as we can design our buildings to conform to the most rigid building codes. If you require permit drawings, our in-house designers can provide custom drawings to your exact specifications. Here is a list of municipal offices by state and other useful information on our permits and zoning page. There you have it – five of the first things you need to consider this new year before getting down to the fun stuff. We’re here to guide you through each step, so contact us at any point in the planning process. Before you know it, you will be enjoying the freedom of extra space and achieving your lifestyle goals. 2018 will be a year to remember! Whether you enjoy alone time or spending time with others, prefer mountains or oceans, seek thrills or relaxation, there’s a cabin lifestyle for you. First consider which natural setting appeals to you and why. Is it near a riverbank, farmland, lakeshore, deeply wooded area, or the mountains or valleys? How far are you willing to venture? If you are considering entire summers away, the distance from home to cabin can be less than year-round weekend jaunts. Does proximity to amenities matter or are you okay with being far off the beaten path? Some of us crave seclusion while others like the comfort of a community nearby. What’s your leisurely pleasure? While cabin life can satisfy many lifestyles — artsy, sporty, foodie, crafty, romantic or relaxing — the way you want to use your space most often will help you narrow down the options of where you want to build. Once you have an ideal location or cabin lifestyle in mind, be sure to scout the area, view open houses, or rent a similar place for a night to ensure that your romantic notions are in line with reality. While you may imagine the idea of waking up to distant sweeping views of a lake or mountain range is heavenly, you might realize you prefer to be on the water or closer to the action. Long for life amid the woods with the fresh aroma of crushed pine needles? In reality, a bright open sky may feel more uplifting long term. Much like eating foreign foods, you won’t know what you like until you try. Remember to consider safety, zoning and permits, price and taxes, and plumbing and electrical access just as you would consider the view, foliage, weather or temperature. All of these are equally important. Much like choosing the location, deciding on the size, features, layout and structural elements of your cabin come from combining the fun fantasy with the reality of cabin life. Beyond the essentials — like water, power and waste treatment — consider the size of the cabin and position on the lot. Ensure the cabin fits the space, maximizes the outlook and orients to the sun patterns. Consider how time outside of the cabin will be spent when picking a location. Do you want a firepit, an accessible driveway, a garden or hot tub, and other add ons? Remember the big picture and how elements will flow together. It’s also helpful to think about the number of people likely to stay, visit or be entertained in your cabin. Are you eager to host a party or prefer enough room for yourself and your thoughts? We offer options for both camps. Loft-beds are a great way to maximize vertical space for storage or sleeping. Style and function come together in every Summerwood cabin. How that looks is up to you. Our cabin styles vary by unique design with distinct advantages and personalities. Explore the features that feel right for you and we will customize from there. The classic cabin with a peaked loft and generous porch — like our Canmore Cabin — is a perennial favourite. 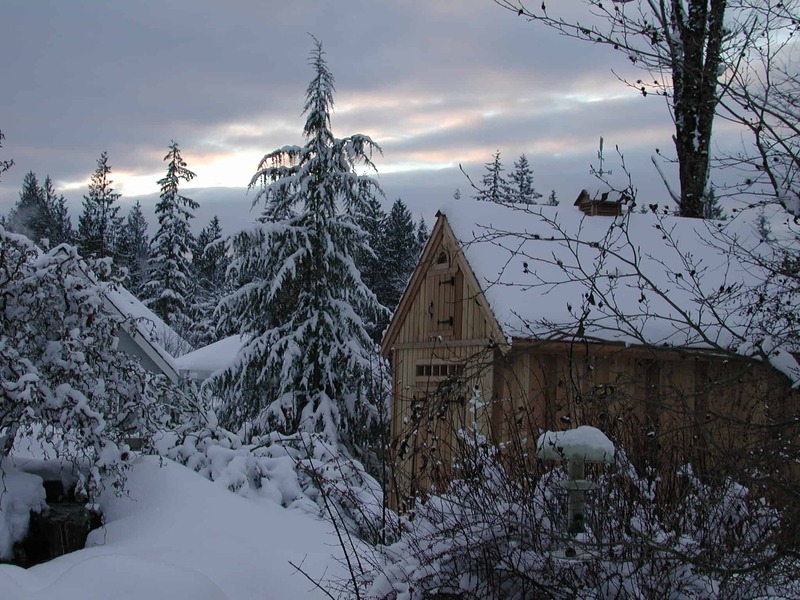 Tremendous natural light year-round and ample space for storage defines the Kepler Creek Cabin. Feel better with basic? Check out the 10 x 10 Bala Bunkie Cabin for its compact minimalism that delivers big personality. Still uncertain? Visit our cabin favourites for inspiration and take a 3D tour through some of our popular designs. Now for the really fun part. Consider the details to make your cabin your own. Roofing, siding, paints or stains, skylights and trims – the options are endless on our material choices list. Regardless of design nuances, be assured Summerwood only uses the finest materials on the market. Most of our cabin kits are constructed from premium grade western red cedar while offering durable and attractive Canexel maintenance-free wood fiber siding. There’s no need to feel overwhelmed! Simply take your time and consider how these details will make this build feel like your own personal space. 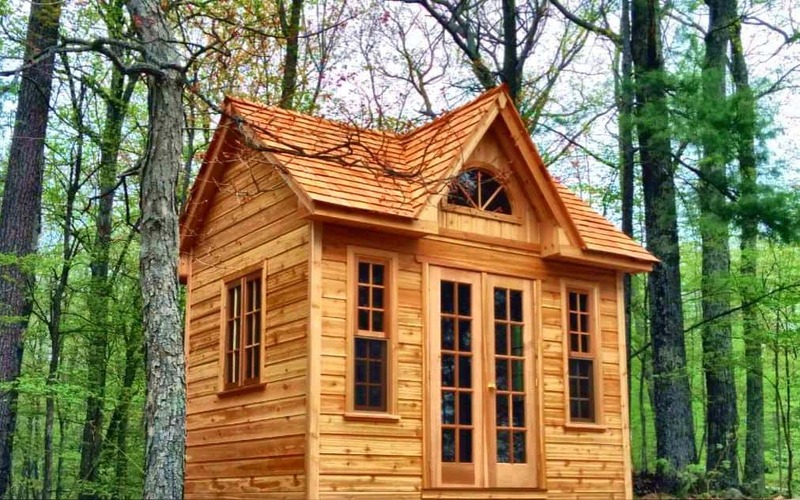 Summerwood cabin kits are a DIY dream come true. Each cabin comes with detailed, step-by-step instructions and live help is available, only an email or toll-free phone call away. Carve the time, build the energy and organize the tools needed to complete the project. Learn more about its assembly and required tools here. Prefer help? View our how to hire a contractor package for more information. From cozy rustic to minimalist contemporary, Summerwood can help bring your vision to reality and perfect your cabin in no time. Our pre-cut designs are easy to customize. Our process takes the stress out of what can be a daunting notion: creating the cabin of your dreams. The Summerwood team is always happy to help. Whether it’s questions about materials, sizing, styles or customizing any of our builds, no question is too small nor idea too big. We welcome you to be in touch through email or by phone here. Let’s agree there is no better time than winter to enjoy the great indoors! When the weather outside is less than delightful, the search for warm surroundings is universal. The Danish have a word for it —hygge (pronounced hue-guh)—which roughly translates to that feeling of familiarity and welcoming coziness that has been adapted into decor and design inspiration, particularly during the colder months out of the year. Scandinavian or not, making favourite places a little cozier encourages creative wintertime use of our Summerwood spaces, whether it’s a back garden studio, workshop, she-shed, pool house or cabin. From prized spaces of solitude to social hubs, winter-time comfort is never far off in a smaller dwelling. Here are some of our favourite ways to make your place warm retreat from bitter weather and early dark nights. Winter is no time for bare surfaces. When the temperature drops, we pull out the knits. Blankets, carpets and throw-pillows are all great additions to making a space feel comfortable and intimate, and can easily be introduced or removed based on the season and changing decor preferences. Drape the layers over benches, toss them over couches, and nestle them on your favourite chair for a a warmer, softer, and more welcoming vibe on crisp day and chilly nights. Eliminate starkness from your space by including different textures across your furnishings. The difference in textures will contribute to overall hominess of your dwelling, where variations in pattern, fabric and even types of art can add depth to your decor. This mix-and-match of textures will make for a unique coziness. For example, an old leather chair, a worn wooden table, sheepskin throw or a knit blanket all provide different tactile experiences that together add visual interest and a welcoming softness to a space. An easy way to influence the mood of any room is through lighting. For a simple way to make your space more peaceful, swap out cooler lighting for yellow-toned bulbs that cast a warming glow. Consider additional lighting beyond a single overhead bulb to usher in warmth and offer a sense of scale—think dedicated reading nooks, shelf lights and any other features you’d like to bring focus to. Nearly every colour has a mood, and can offer both warmer and cooler hues across different shades. Cooler colours make a space feel larger and airier, while warm colours make a space feel more intimate and are generally more welcoming. For friendlier, warming influences in your space, choose options with yellow, red and gold undertones. For example, opt beige or cream instead of stark white, or deeper, more richly pigmented shades of your favourite colours for the walls. Warmth in decor is often related to a sense of comfort and inviting hominess. A great way to conjure this feeling is to include our personal items in our spaces. Whether it is a set of vintage skis hung off the wall of a cabin, a stack of favorite books, an old framed poster, or even a chair that no longer matches a remodeled living room, personal pieces offer our spaces familiarity—an essential for lasting comfort. Do you use your Summerwood build during the winter? What are your favourite ways for adding cold-weather pleasures to your space? Let us know by joining the conversation on Facebook, Twitter and Instagram! With the right color scheme, you will not be able to help but grin whenever your shed enters your view. Just a glance at the perfect blend of colors can have an amazing effect on your mood, energy levels and sense of well-being. 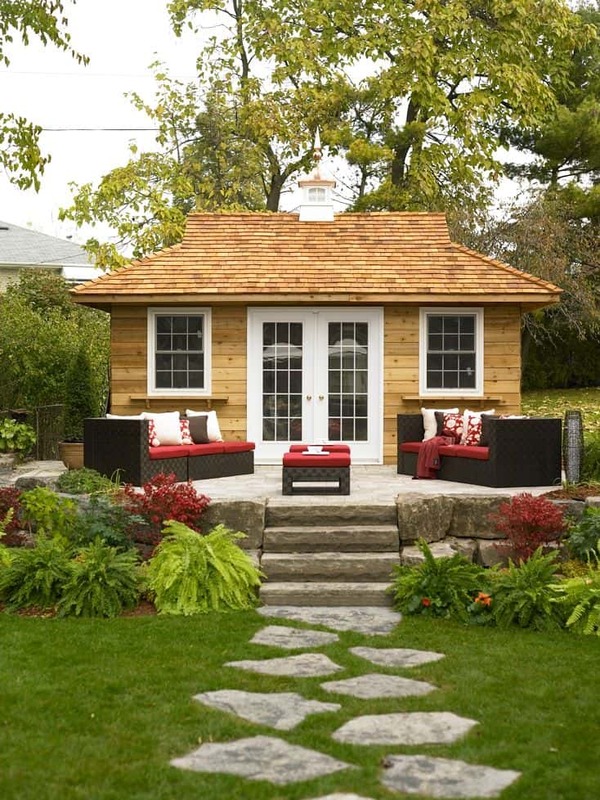 Your shed’s color scheme will also help it meld with your exterior décor to create the landscape of your dreams. Knowing how to create an ideal color scheme requires inside information about the theories and tools utilized in the design realm. Luckily, you can read through this guide to learn all you need to know about the selection of an attractive color scheme for your shed. The primary, secondary and tertiary tones on a color wheel can act as your guide during the color selection process. To create a cohesive color scheme, you need to select two base tones using popular color rules, including analogous or complementary combos. Analogous colors sit directly next to each other on the wheel. Their direct proximity gives the tones a matching quality that looks great when paired on a large structure. Complementary colors, on the other hand, are located directly across from each other on the color wheel. The direct contrast of these tones gives your color scheme a sense of balance. You may also utilize other color rules, such as triad, compound and monochromatic, to combine attractive shades. Your main colors will work best on the largest surfaces of your shed. You can paint your shed in a high and low two-tone scheme or use one color for the siding and the other for the doors. Select a somewhat neutral contrasting color for the trim to make your base colors really pop. Think beyond white, black, gray and tan neutrals, however, to create a truly unique color scheme. When paired with vivid tones, for example, pastels in the same color family can act as a stunning neutral for your trim pieces. Before you head out to buy paint, play with color combinations by utilizing smart software programs. The programs allow you to create color schemes using a wide variety of combination rules. You can utilize the all-inclusive color tool, Kuler by Adobe, to explore innovative combinations using all of the popular color rules. You simply use your cursor to pull the tabs into the shade you prefer to see similar tones that follow the selected rule. The tool gives you the Hex and RGB codes for each tone, so you can identify the exact colors you want when it comes time to buy paint. If you want to match your shed tones to your outdoor décor, consider utilizing the Colr page to identify your existing color elements. You will upload a picture of your landscape or outdoor décor to have the color elements analyzed in real time. Upon revealing the colors you prefer, you can click through the options to find a paint with those exact tones. With your newfound knowledge and helpful tools, select at least three color schemes you feel would look great on your shed. Head to the hardware store or paint supply depot to pick up swatches that best match the colors in each design array. Bring the swatches home and view them next to your existing outdoor décor to view their impact on the surrounding environment. Make sure to pay close attention to how each one impacts you and narrow down your choices. The winning color scheme will likely feel just right as you view the tones against the backdrop of your shed and its surrounding decorative elements. Cedar is by far our favourite siding material (check out our post on “The Best Construction Materials for Building Your Own Shed: Sidings”) for countless reasons. Although we understand the need and convenience of maintenance free options, when it comes to siding we simply can’t compete with nature. Western Red Cedar has been our first choice for years due to its durability, ascetic appeal, and environmental sustainability. At Summerwood, we always recommend that our customers stain their cedar-sided building. But why do you need to do so? Although you can let your cedar whether naturally when used for a deck or a fence, when you’re using it as a siding the idea is to keep the elements out. You want your beautiful custom backyard building to stay that way, and for your belongings to remain safe and dry inside. Staining the cedar is the absolute best way to ensure this, especially in four-season climates. Since Western Red Cedar naturally lacks pitch and resin, it allows for countless staining options and will accept stain very well if applied correctly. Below, we’ve got 10 tips to get your staining started and keep your outdoor structure looking brand new for years to come. 1. You have three choices: natural, semi -transparent, and coloured or opaque. Consider whether you want your building to look untouched, or add a pop of colour to your yard before choosing. 2. Cedar is known to age gracefully to a soft, silver-grey patina, but it’s wise to keep the rich tones of your cedar siding lasting longer. Transparent stains contain no pigment but have water-repellent features that will help to retain natural tones and slow down the natural colour change process. Win-win! 3. Semi-transparent stains offer up a hint of colour. They still represent the wood beautifully, but give it a little boost. Grains and knots in your wood will be modified, not enough to take away from its natural qualities though! 4. Coloured/opaque finishes allow you to have fun with your finished product. If you want to go for a dramatic look, or maybe add a little extra charm, this may be the way to go. This option isn’t for the indecisive though, so make sure you know exactly what you want! 5. Once you’ve decided on your finish it’s best to get to work quickly. The sooner you treat your cedar, the better. Although cedar is naturally resistant to rot and decay, staining your siding promptly aids in preventing deterioration. 6. Prepare your cedar siding by washing it with soapy water to remove any dirt or dust (if any has accumulated). 7. All stains should be applied on a clean, dry surface with a brush to ensure maximum penetration into the grain. 8. Is your cedar siding vertical? Begin from the top to the bottom. Is your cedar siding horizontal? Start at one corner and continue to the other. Go with the grain! 9. Two coats are always recommended when you want to maintain the natural look of Western red cedar. 10. Bask in the glory of your newly finished cedar building for years to come. For countless styles and options, cedar is consistently the best choice! Please don’t hesitate to contact the design experts at Summerwood with any questions you may have: 1-866-519-4634. If you’re ready to design your very own spectacular cedar building, or do some brainstorming, our Design Center will get your creative wheels turning!